What cars do the royals drive? 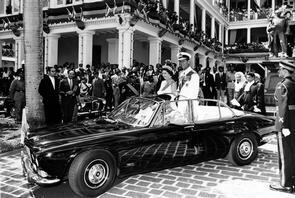 The Queen has a number of official vehicles for state duty, one of them being a Phantom VI she was given for her Silver Jubilee… way back in 1978. She got another car for her Golden Jubilee in 2002, this time from Bentley, and she has an assortment of other, specially made (coachbuilt) Rollers, Bentleys and Daimlers that ferry her about in style, allowing her to get on with the arduous task of waving to the proles. One of the most contentious ones on this list, because it was a high-spec Freelander 2 that Prince Philip was driving when he was involved in his ‘little’ accident earlier this year, while leaving the Sandringham Estate in Norfolk. Land Rover, and also Jaguar, feature heavily on this list, because the Royals love British marques. Obviously. If you’ve seen the 2006 film The Queen, with Helen Mirren playing the titular monarch, you’ll know there’s a scene where she’s driving a Defender around some windswept Scottish moorlands near Balmoral. Well, this is actually based on a truth – HRH Liz II loves a Defender, while there have also been various models of the plusher Discovery in the Royals’ possession over the years. Anyone who watched the Royal Wedding of Wills and Kate in 2011 will perhaps remember that the pair of them drove themselves away from part of the ceremony in a rather spiffing blue open-top Aston. Well, it’s a DB6, given to Wills’ dad (that’d be Prince Charles) when he was 21, by none other than the Queen and Prince Philip. It’s a lovely vehicle and one the family will no doubt keep, given it’s an absolute stonewall classic and probably worth a small fortune. General Royal protocol means there’s a wealth of high-end machines available to the Windsors, which can be pressed into service at any time. Various Jaguar XJs have been employed over the years, while Charles reputedly has a long-wheelbase Audi A8. That mention of the German company is apt (given the Windsors are descended from House Saxe-Coburg-Gotha in the first place…), because the younger Royals – Wills and Kate, and Prince Harry – drive an A5 Sportback, an A3 and an S3, respectively, as part of a tie-up between the family and the Ingolstadt brand. Besides these cars, you might spot the Royals in vehicles like Range Rovers or a Bentley Flying Spur, continuing that luxury British beef theme.